October is a month of celebration, always has been. Even way back in elementary school, it was birthday celebrations, when the birthday girl brought a box of donuts to class to share with the homeroom. (That birthday girl happened to be me.) Turns out some of the most special people in my tiny world share October as a birthday month. This first full month of autumn also marks the peak of preservation season, the elusive quince harvest and the first true chill in the air. Now there are two more reasons to celebrate in October with the inaugural year of both National Farm to School Month and American Cheese Month. Who could ever imagine such bounty! Have you heard of Farm to School? You likely have, even if you don't know it! Farm to School is the concept of connecting students with the roots of their food, and connecting local farms with schools. There are a ton of different ways to create a Farm to School project, and no two look the same. School gardens, Harvest of the Month programs, local salad bars, cooking in the classroom, agriculture education, taste tests and farm field trips are just the tip of the iceberg (lettuce) of creative ways to connect farms and schools. The goal of Farm to School is to serve healthy meals and snacks in schools, improve child nutrition, create opportunities for students to learn about the food system, teach students about nutrition and support local agriculture. The last on the list, increasing economic opportunities for producers and those in the food distribution chain (like light processors and distributors) is a very important benefit of Farm to School because it contributes to strong and sustainable regional food systems. Want to geek out on Farm to School? Check out the National Farm to School Network and look for programs in your state. In November 2010 Congress officially showed its support for the value of Farm to School by naming October National Farm to School Month. Much thanks to Representative Rush Holt from New Jersey for introducing this important resolution and another reason to celebrate each October. The inaugural National Farm to School Month is being celebrated by students, schools, districts and states across the country as a way to highlight incredible Farm to School programs and promote the successes of this wonderful concept. Folks are encouraged to invite farmers and chefs to visit schools, enter the Farm to School Month Poster Contest and share the good news widely. Farm to School month provides a double reason to cheer: formal recognition of the importance of Farm to School and a full-scale effort to promote these excellent projects! As if this month weren't already chock full of excellent activities, this October marks the first annual American Cheese Month. Lest you think this is the promotion of those square slices of plastic-wrapped cheese-like-substance, it is not. 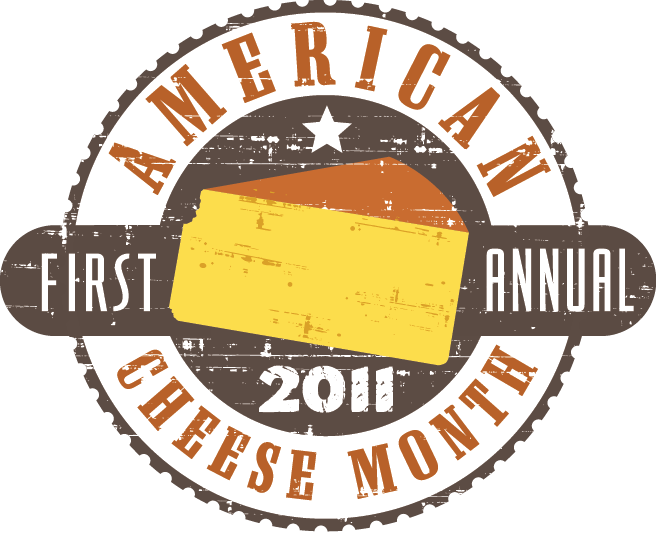 The American Cheese Society is the good name behind this campaign, with the sweet intention to "recognize and raise awareness of the quality and diversity of American cheeses." I don't know about you, but we don't need a reason to celebrate cheese in our household, we do it every day - mostly by consuming large quantities of this delicious goodness. 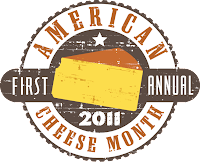 But I won't rain on anyone's parade, so this month cheesemakers, cheesemongers and cheese enthusiasts are encouraged to promote American cheeses through meet the cheesemaker events, cheeserie tours, local cheese features and media events. I'll do my part by encouraging you to seek out the best cheese shop in your neighborhood (if you are in Madison, by all means go to Fromagination! ), be daring and purchase a new style of cheese at the Farmers' Market, and give thanks to the cows, sheep, goats, buffalo, farmers and cheesemakers who work tirelessly to hand-craft delicious cheesiness for your enjoyment. In a million years I never expected that everything I love could be wrapped up in one month: celebrating great people, promoting farm to school and eating delicious cheese - what could be better? Go forth for the remainder of October: bring your favorite teacher a local apple and savor the cheese of your local artisans!